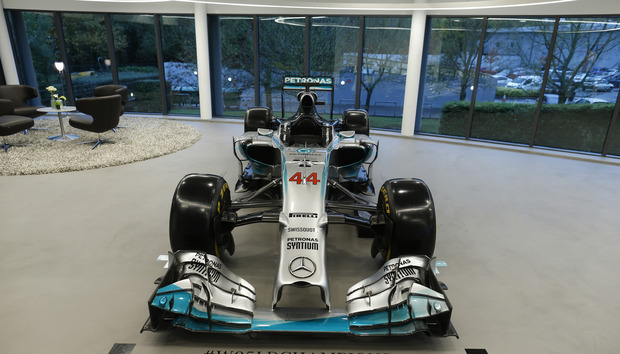 “We’ve won both championships this year so we are working on next year’s car and when we go into the main building we will see parts being built for next year’s car,” says Oliver Tennant, Partner Executive at Mercedes AMG Petronas Formula One Team. I am standing with a group of other journalists outside the Mercedes AMG Petronas Formula One factory in Brackley, North West London. Formula One racing is notorious for putting its racing drivers through the paces in extreme conditions. So I am pretty excited to get a behind-the-scenes look at the factory where we will see the lifecycle of a car, the control-room, and try out the simulator. Tennant takes us into the main building where we see a few painting and drying booths with a group of about five or six men wearing protective masks and working on various materials. They eye us suspiciously but keep working. Tennant is full of impressive facts about the sheer amount of work that goes into perfecting the cars in preparation for each race. Weight is something they factor into everything and he says that every year the amount of paint put on cars is being reduced as it “adds weight to the car” and the “total weight of the paint on the car is less than two kilos”. As we come to one of the models, Tennant draws our attention to the cockpit of the car and says that temperatures in the cockpit can reach the “40-50 degree Celsius” mark. It is fascinating to see the model of the car completely stripped down and Tennant says that it is designed in a way to “maximise the space for the safety of the driver”. “The only risk nowadays is flying objects that can hit the driver’s head and there is debate around closed cockpits and open cockpits. For now, it has been decided to keep it open,” Tennant explains. Tennant then points at various aspects of the car with impressive facts about air speed and pressure measures and says there are advantages to being a light-weight driver as it means that more features can be added to the car. He also says that the rate at which things develop in Formula One racing is extremely fast so that the “2012 car will be nothing like the latest model”. It’s really interesting to learn how the cars are monitored on the track and Tennant says there are around 200 sensors all over the car. The sensors detect things like engine temperature and speed and all of the information is collected during the race and sent back to the factory here in Brackley, where it is interpreted by telecoms and internet services provider, Tata Communications. The engineers are constantly monitoring the data to anticipate and predict situations that could go wrong. Multi-tasking is definitely a must-have skill for Formula One drivers. “Sometimes the sensors can recognise a situation which does not look good and will automatically fail that sensor so the car does not shut down. The driver has to reset that sensor and the process of doing that is incredibly difficult to do when you’re driving at full speed,” Tennant tells us. “There’s a series of buttons they have to press at the same time as racing and trying not to be overtaken. The sensor system creates a lot of work for the drivers but it’s the sort of data we need,” adds Tennant. We are taken into the “inspection room” which inspects parts that have just been manufactured or come back from races. The main point of the inspection is to check for cracks by soaking metallic pieces in a fluorescent dye and checking them under a UV light - which shows up any cracks. Tennant tells us that this is a “clever and non-invasive way of checking the integrity of the pieces and that they aren’t damaged in any way”. Tennant then points to a very small machine with a tiny node that checks over the cracks and stresses how much patience the guys have in “inspecting big parts of exhausts all the way down to nuts and bolts”. I’m sure we are all thinking the same thing and I can’t help myself and say “Maybe it’s time to get a bigger machine?” and everyone laughs. Tennant laughs too and says “It seems like a logical solution”. The race-support room is where all of the data from the race track is displayed and when we go in, we can see a stream of videos, mostly with Lewis Hamilton talking. We are told that restrictions in regulation mean that only up to 60 people are allowed to be taken to the race track at one time. This allows Mercedes to save costs and abide by regulations. “You have guys at the track working in stressful conditions whereas over here we can have the same data being sent back and the engineers have that more relaxed environment to work in and not make mistakes,” Tennant tells us. He points to two engineers that work with Lewis Hamilton and who support Hamilton on the race tracks. I do wonder if Hamilton would be completely screwed if one (or both) of his engineers called in sick on the day of his race. Where does Tata Communications come in? Tata Communications started working with the Mercedes Formula One team almost three years ago and provides the necessary communications link for Mercedes to plan and analyse all the data. Before each race, Tata gives a complete route of data to Mercedes. It analyses country conditions and provide alternative route options in case of problems. During lunch, Mehul Kapadia, head of Tata Communications’ F1 business says “around 20% of international voice calls go through Tata Communications”. After having a lovely lunch followed by a yummy chocolate fondant, we are told that we will each get to try out the simulator. Tennant and Harris laugh and warn us that it has made people motion-sick in the past so not to be too surprised if we face the same thing. After hearing this, I immediately regret eating that desert. Especially as I am told that I am first one up and we each have 15 minute slots. I squeeze into the cockpit of the car but my legs can’t reach the pedals so I end up in a strange half- lying down position, unable to see at the top of my steering wheel. Luckily, help is on hand and I am given some props to put behind me which helps my feet reach the pedals. Much better. I really enjoy racing games on the PlayStation so I am ready for my moment to shine and show-off my Formula One racing skills. But there were a couple of tricky things to overcome first. First challenge: Getting used to the steering wheel. For some reason, I had an image in my head of the steering wheel being relatively uncomplicated but it has tons of buttons on it. So initially I (shamefully) stall the car a few times, go up the gears when I am supposed to be going down. Thankfully, I don’t go off the track though. Second challenge: Trying not to hurl. Finally, I get going and ram the accelerator down around the track. This part is really fun and the race track feels incredibly real. Just when I am finally beginning to feel like Lewis Hamilton I start to feel queasy. There’s no timer so I can only estimate I have been in the cockpit for about ten or 11 minutes so far. I don’t want to wuss out, surely I can last five more minutes? So I persevere, determined to at least complete my 15 minute time-slot. But a few more minutes in and I feel like I will hurl and consider the other guys won’t be too happy trying out the simulator covered with vomit. So I reluctantly give in and climb back out. Wearables for Formula One drivers? Once my stomach has calmed down a bit I catch up with Matt Harris, Head of tech at Mercedes AMG Petronas F1 team. We talk about the sensors on the cars and the way the data is collected. Are there any plans to implement more tracking devices? “If they could they would! The weight is an issue. We are always trying to get the car as close to a minimum weight as possible. A driver eating the wrong thing one day could change that to a kilo or half a kilo,” says Harris. After a long day it’s time to go home. It’s been a thrilling ride and it’s hard after seeing everything to not have a new-found appreciation for Formula One drivers. My stomach is still churning though so Lewis Hamilton need not be worried.